How Do You Enter Jerusalem? What was it like in Jerusalem on that day we now call Palm Sunday? Imagine -The energy level is intense as spiritual pilgrims flood into the city for the most holy Passover Festival. People jostle in packed markets hoping to get a sufficiently large and tender lamb. A vendor haggles with three customers to the get the best inflated price for his stock. The Temple bustles with last minute cleaning and decorating, clinking coins are carefully counted, a cacophony of cattle, lambs and dove calls. Roman Guards are posted, alert for pick-pockets and trouble-makers. Scribes and rabbis are rehearsing their teachings, ready for arguments and debate on hot-button issues and the questions of pilgrims. Both sides are aware that Jesus of Nazareth is rumored to be on his way. Will he come like John the Baptist with fire and fury? Or could he be turned into an ally for our side? Many people just want a nice Seder without family arguments over theology and politics, merchants and Temple leaders just want enough peace to bring in the shekels, but others have important statements to make. Passover is not just any religious feast, with pageantry, piety, and good pastries. Passover has symbolic power. It marks God’s liberating action of an enslaved people, as plagues and pain rain down on the cruel Egyptian overlords for their tyranny. This is not about a day off and sharing your new mint lamb or Hrosis recipe. One part of society says Rome is good for business, they build the roads and spur technological innovation. But others feel taxed to death for Roman wars and resent both Hellenization of the culture and the economic hierarchies create by all the Roman carpetbaggers. Passover begins, and at the West entrance of Jerusalem, with Pilate, more properly, Pontius Pilate, fifth prefect of Judea, who had been “Keeping the peace” for 7 years. He rides into the city with his heavy cavalry, (the assault rifle of the ancient world) hoofs beats pounding a message of power and authority, polished armor and golden Eagle standards glinting in the sunlight. Order will be kept. Some in the crowds feel relief and other people feel the hair stand up on the back of their neck. On the east side of the city, away from the mighty main gates, on the poorer side of town, Jesus is coming down from the Mount of Olives. This is the area of a vast cemetery, over 150,000 graves have been discovered there. According to the prophet Zachariah, chapter 14, when the Messiah comes, Yahweh will come down to the Mount of Olives and it will shatter in two. And the Resurrection of the Dead will begin there, hence the cemetery. This will be where Jesus retreats to each night, to the Garden of Gethsemane at its foot. Jesus comes not on a war horse, but a donkey, no army but his ragtag followers. The donkey is a symbol of humility and peace. Symbols matter. Pilate with his war horses, Golden Eagles and weapons, Jesus with Passover, a donkey and Palms. Jerusalem was in the midst of a culture war and Passover injects the symbolic trip wire to trigger an explosion. What was it like? Think of our own cities caught in the culture war cauldron. Charlottesville, Virginia became a battleground as Nazi and White Supremacists came to rally around monuments of the Confederacy. Think New Orleans, a predominantly black city in the heart of Dixie, where thousands of people from around the country came to either defend a Robert E. Lee statue or uphold the cities decision to remove it. Death threats are made, local contractors won’t take the bid for removal for fear of violence, people stand in candlelight vigil the city councils decision to remove is carried out. Think of America yesterday as the March for Our Lives These symbolic cultural wars have deep resonance and real implications beyond identity for both sides, whether we are entering Jerusalem or any city in America. Jesus begins with empathy and compassion for the suffering of the people. Then he rides in on a donkey as a sign of humility and peace, as opposed to violence and power. I wonder if the palm wavers wanted Jesus to fight power with power. But he does not give in to that impulse. Nor does Jesus avoid the tough issues, as the next day he enters the temple and starts kicking over the tables of the vendors in a prophetic action. Jesus will disrupt and interrupt to make his point, but his message is one of nonviolence, and compassion for those on the margins of society. How will we ride into our own Jerusalem, boiling with tension on Palm Sunday? I am greatly encouraged by the activism stirred by the Parkland, Florida students. They are coming from their own Mount of Olives, past the graves of their friends, and what they are doing is not just debating about public policy. They are bringing us to tears to weep over our cities like Jesus wept over Jerusalem. They weren’t simply marching for gun control, but for a different world, where glorifying violence and seeing it as a solution is not the way. As their theme said, a March for Our Lives. 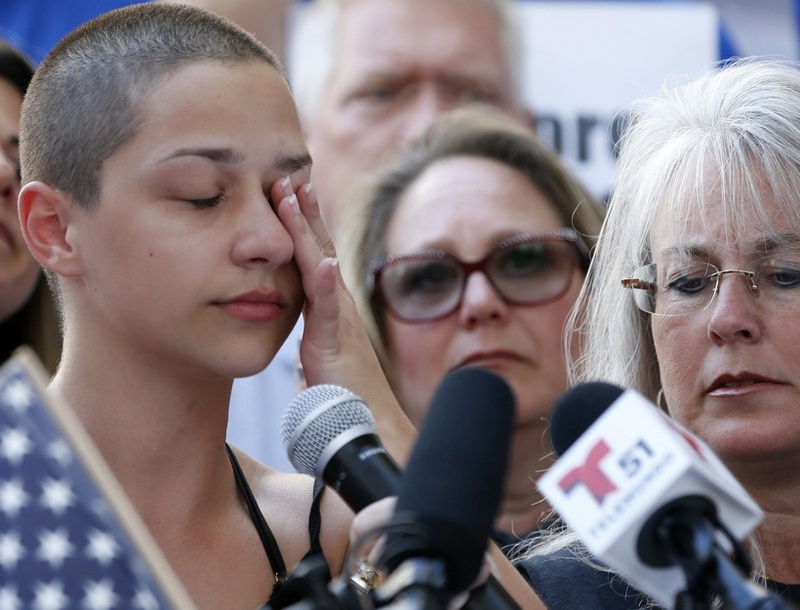 Emma Gonzales addressed the crowd yesterday in DC and stood in silence for 6 minutes and 20 seconds, the time it took for 17 of her friends to be murdered, by Nikolas Cruz, a deeply troubled young man, who received his gun training a weekend at a white nationalist rally. This is not just about Gun Control, however necessary that is. This is a moral, cultural and theological challenge. Pay attention to what the NRA is saying to their own members in response. Watch their one-minute commercial on their YouTube channel where Dana Loesch says, “Protestors are perpetrating a hateful attack on our system of government and our President, and their goal is to destroy it. This is an insult to each of us and they think we are so stupid we will let them get away it.” While she spills her venom, there are rapid fire images of football players taking a knee, large protests, with a focus on people of color, and a call to stop them and the need to be armed. She concludes, “Their fate will be failure and they will perish in the flames of their own political fires. We are the National Rifle Association and we are freedoms safest place.” This video is just a hairs breadth from calling for a violent civil war against anyone who protests their political position. The NRA has made this about more than guns and hunting. Their vision is that the world is on the brink of an apocalypse, and everyone needs to be afraid. We have to counter this not only with good public policy, but good theology. In the March 2018 Atlantic Magazine, Michael Gerson asks the question, “Where Did Evangelicalism Go Wrong?” One major point he makes is the embrace of apocalyptic theology, that believes the world must get worse and worse, until it climaxes in flames and then Jesus comes again to save us. This theology destroys all motivation to act for peace and justice. Why try to stop gun violence when the world is going to go to Hell in a handbasket, and that is God’s plan? Why work to combat climate change if the planet isn’t supposed to last? Gerson notes that apocalypticism is incompatible with democracy, because you have to believe things can get better to engage in democracy. This is why we keep preaching hope and inclusion, Sunday after Sunday, to counteract the messages of fear, paranoia and division of people along the lines of race, gender and sexual identity. Its why we say every Sunday, “No matter who you are…you are welcome here.” We believe in an inclusive, welcoming community, not one based on fear. I am encouraged that the March for Our Lives Movement when beyond school shootings to emphasize all forms of gun violence, and invited speakers like Mya Middleton, a 16-year-old from Chicago to talk about the constant threats of violence, and Edna Chavez from Los Angeles, whose brother was shot dead. Students from Baltimore and Ferguson and New York City have been organized for months to combat violence, and making progress despite inaction from legislatures, and despite little media attention. Today there are 18 cure violence programs in New York City to end shootings. One program, Save Our Streets, in the South Bronx, has reduced shootings by 63 percent. Why not put our attention into creative non-violent solutions that are shown to work, rather than arming our teachers and militarizing our police forces? The historical moment brings us to a choice. How will we enter our Jerusalem? Will we enter from the West on a war horse? Or shall we come from the East, untie the donkey, pass the graves, and practice peace?